There are 19 Assisted Living Facilities in the Morristown area, with 2 in Morristown and 17 nearby. The average cost of assisted living in Morristown is $3,600 per month. This is higher than the national median of $3,346. To help you with your search, browse the 146 reviews below for assisted living facilities in Morristown. On average, consumers rate assisted living in Morristown 4.0 out of 5 stars. Better rated regions include Morris Plains with an average rating of 4.2 out of 5 stars. Caring.com has helped thousands of families find high-quality senior care. To speak with one of our Family Advisors about assisted living options and costs in Morristown, call (855) 863-8283. Morristown offers the convenience of a small town, with big-city amenities within reach. The city is just 30 miles west of New York City, enabling seniors to hop on the train or in the car to enjoy world-class entertainment, dining and shopping in the Big Apple. Morristown has two assisted living facilities and seniors will find another 48 nearby, including some in New York City boroughs. 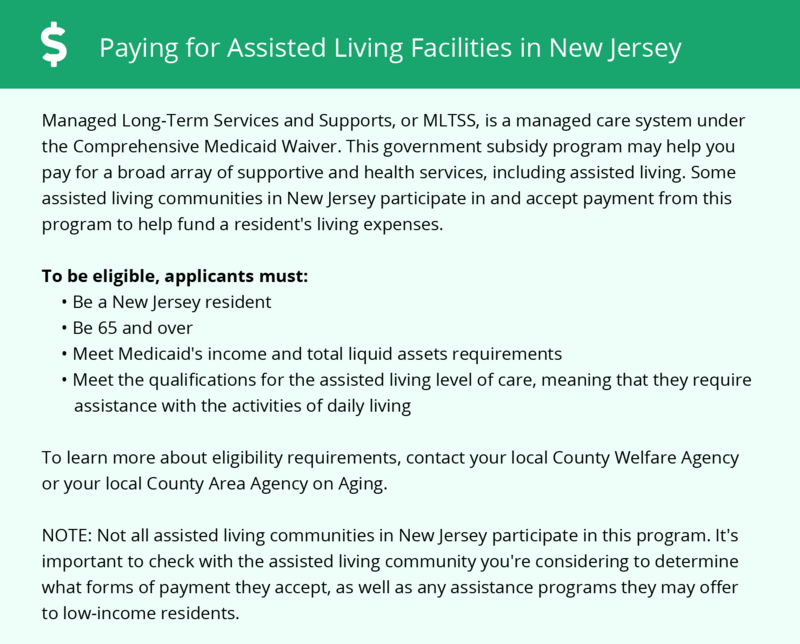 The New Jersey Department of Health and Senior Services regulates and licenses all assisted living residences, or ALRs, in the state. Seniors living in Morristown will experience all four seasons. Average high temperatures plummet to the 30s in the winter, with regular snow. In the summer months, average high temperatures reach the mid-80s. Cost of living is high in Morristown, about 46 percent higher than the national average. As a result, seniors can expect to expect assisted living costs to exceed the national median as well. Morristown is safer than about 35 percent of U.S. cities. While its violent crime and property crime rates are slightly higher than other New Jersey cities, these rates are lower than national averages. Morristown has a station for the New Jersey Transit commuter rail, providing seniors with access to a hassle-free drive into New York City. The Morristown station is wheelchair accessible for seniors needing assistance. The Morriston area is home to world-class medical facilities, including the Morristown Medical Center, in the event of medical emergencies or illness. Morristown has an array of community resources for seniors, including the the city's Parks and Recreation Department, an organization that offers exercise classes, social activities and special interest club meetings, as well as one senior center. Assisted Living costs in Morristown start around $3,600 per month on average, while the nationwide average cost of assisted living is $4,000 per month, according to the latest figures from Genworth’s Cost of Care Survey. It’s important to note that assisted living rates in Morristown and the surrounding suburbs can vary widely based on factors such as location, the level of care needed, apartment size and the types of amenities offered at each community. 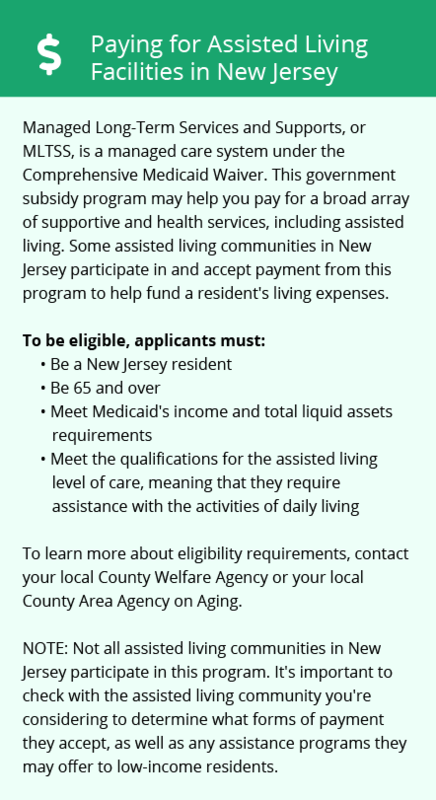 Eligible seniors in Morristown can access two state programs that help finance assisted living expenses. The Medicaid Managed Long-Term Services and Support program is available for seniors who meet income, disability or clinical requirements. The state also offers an optional state supplement to Medicaid-eligible seniors receiving supplemental security income. This supplement comes in the form of a capped monthly stipend to put toward assisted living expenses. Morristown and the surrounding area are home to numerous government agencies and non-profit organizations offering help for seniors searching for or currently residing in an assisted living community. These organizations can also provide assistance in a number of other eldercare services such as geriatric care management, elder law advice, estate planning, finding home care and health and wellness programs. To see a list of free assisted living resources in Morristown, please visit our Assisted Living in New Jersey page. Morristown-area assisted living communities must adhere to the comprehensive set of state laws and regulations that all assisted living communities in New Jersey are required to follow. Visit our Assisted Living in New Jersey page for more information about these laws.